The only experience I have with the American public school system is when I was a student in the ’70s – ’80s in West-central Florida. My experience with the Japanese school system is from having three teenagers who attended Japanese public schools from kindergarten to the high school they’re currently attending (college). – In Japan, the school year begins in April and ends in March. In America, the school year starts around September and ends in June. Also, students in Japan have fewer days off than American students. High schools in Japan require passing an Entrance Exam to attend…so these schools usually require the students to take a short commute by train. – In Japanese public schools, elementary school kids wear street clothes to school (like in American schools), but starting in junior high, they must wear a school uniform. – In Japanese schools, everyone must remove their shoes at the entrance and change into 上履き (indoor shoes). 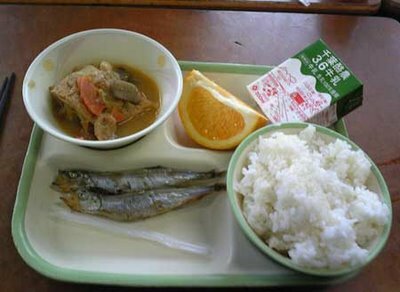 – In Japanese elementary and junior high schools students and teachers all eat the same school lunch. There are no choices. In most high schools, students and teachers are required to bring a 弁当 (packed lunch) from home. And very few Japanese schools have a cafeteria. Students eat lunch in their classroom at their desk. In American schools, there are “lunch ladies” who prepare the school lunches and then serve the students, but in Japan, the “lunch ladies” cook the lunch but students take turns serving lunch to their classmates. – Japanese school children don’t take a shower after gym class. – There are no janitors in Japanese schools. The students clean their school everyday. – In junior high and high school in Japan, almost every student joins a after-school club or team. – 夏休み (summer vacation) is about five weeks long in Japan. It was about twice as long in America, if I remember correctly. And during summer vacation, Japanese students have to go to school many times for their school club / team practice. Also, Japanese students must do a lot of homework during summer vacation. – In American schools, there are no 入学式 (“School Entrance Ceremony”), and 卒業式 (“School Graduation”) isn’t until high school has been completed. But in Japan, there are both 入学式 (“School Entrance Ceremonies“) and 卒業式 (“School Graduations“) for kindergarten, elementary school, junior high school, high school and college. – In America, school grades are counted as 1 -5 for 小学校 (elementary school), 6-8 for 中学校 (junior high) and 9-12 for 高等学校 (high school). In Japan, 小学校 (elementary school) is six years (grades 小1-6), 中学校 (junior high) is three years (grades 中1-3 (equal to grades 7-9)), and 高等学校 (high school) is also three years (grades 高校 1-3 (equal to grades 10-12)). There are many other differences…such as the way homework and tests are administered and checked, the manner that classes are arranged, the fact that Japanese students stand and greet their teacher at the beginning and end of each class, the way that students are trusted in empty classrooms alone…even in kindergarten. I’d say that schools in Japan and America have more differences than similarities. And I think education and school life that my children are getting in Japan is superior to what I had in America. Today my oldest daughter will take her 高校受験 (High School Entrance Examination). She’s a 中学校三年生 (Ninth grader (last year of Junior High in Japan)). In Japan, the school year is 四月から三月まで (from April til March). 小学校 (Elementary School) is grades 1-6, 中学校 (Junior High) is three years (grades 中1～中3…(equivalent to grades 7-9 in the U.S.)), and 高等学校 (High School) in Japan is also three years (the equivalent to grades 10-12 in the U.S.). Both 高等学校 (High School) and 大学 (College) have Entrance Exams. My two younger daughters made a card for my oldest to wish her Good Luck on her test today. 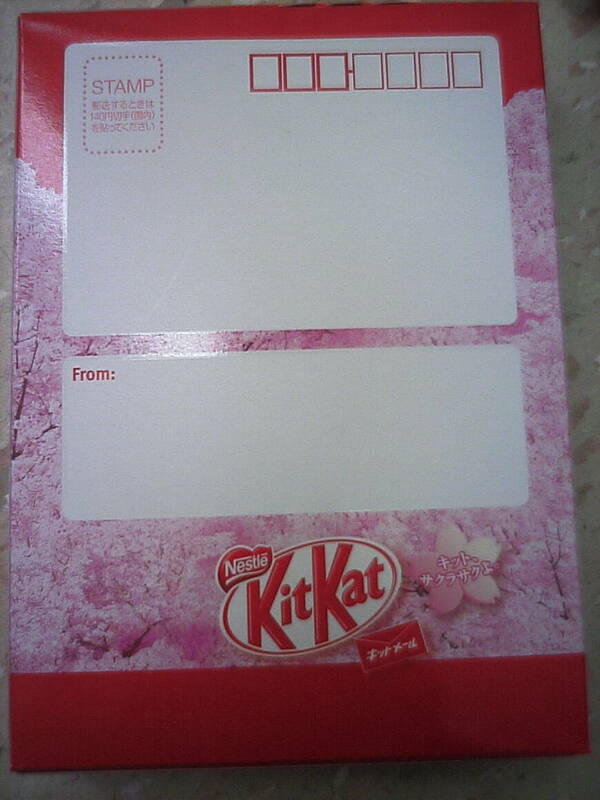 I bought her a box of special Kit-Kat chocolates for students taking School Entrance Exams. Kit-Kat is one of the popular snacks parents give their kids when they’re taking an Entrance Exam. Kit-Kat is popular because it’s name sounds like “I’ll surely pass!” in Japanese. 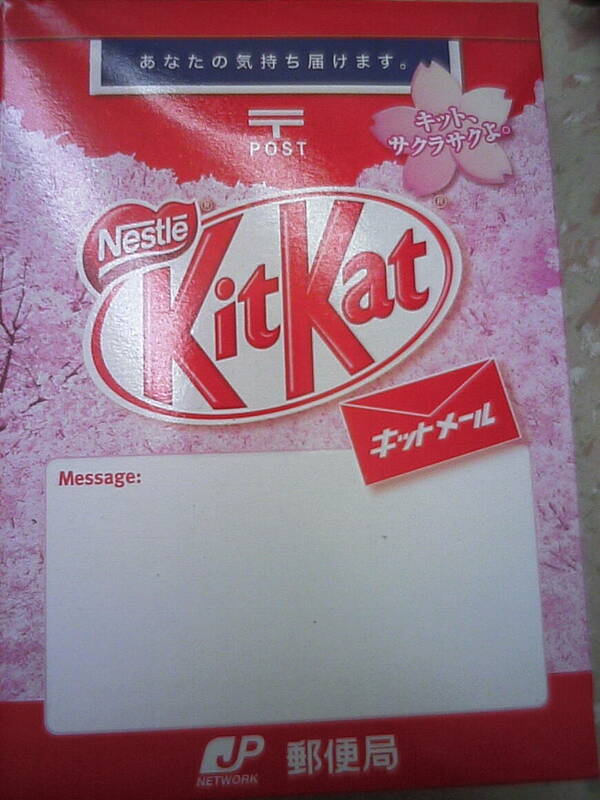 The packaging of the Kit-Kat that I bought is like a postcard…and it can actually be mailed. Every year at this time, our town has a ウォーキング大会 (Walking Rally). It’s organized by the local 小学校 (Elementary Schools) PTAs and it’s open to everyone in the town to meet and walk around the river for a morning of socializing and exercise. It’s especially popular with the elderly and the children who attend the 小学校 (Elementary Schools) and their families. I’m on the PTA of my youngest daughter’s 小学校 (Elementary School). She’s in sixth grade at 小学校 (Elementary School)…this April she’ll begin 中学校 (Junior High). (And my oldest will begin 高等学校 (High School)). Since I’m on the PTA, I helped with the ウォーキング大会 (Walking Rally). I’ve joined this ウォーキング大会 (Walking Rally) a couple times before…but this was the first time I joined it as part of the organizers. There are two courses. A 3 meter course and a 5 meter course. My daughter’s school’s PTA helped with the shorter 3 meter course. So, that’s the course I did. My daughter and her friends walked the 5 meter course. The event started at 10:00. The start-point was at an Elementary School near the river (not my daughter’s school). I and the other PTA members got there at 9:30 to set-up and welcome people when they came. At 10:00, the school principal gave a welcome speech and then the gym coach led us in warm-up exercise…then the people doing the 5 meter course left first. The rest of us waited about ten minutes to give them a head-start so that we could all finish around the same time. We began our walk at about 10:30 and finished at about 11:30. It was a very relaxed pace because, as I said, there were many elderly people and young children. It was enjoyable. I walked at the rear of the group to make sure everyone was fine. I, as well as the other PTA members, wore a PTA armband. An old woman walked next to me and told me all about a trip she took to America many years ago. Once we all got back to the 小学校 (Elementary School), we were handed a ticket with a number on it for a lottery-type game. There were twenty prizes and random numbers were drawn and called out by the 校長先生 (school principal). People with winning numbers on their ticket were given a prize. I didn’t win anything…but my daughter won a box of cookies. Next year I won’t be on the PTA anymore…but I may join in the ウォーキング大会 (Walking Rally) again. Yesterday was my youngest daughter’s 運動会 (Sports Day event) at her school. She’s in the sixth grade (which, in Japan, is the highest grade in 小学校 (Elementary school)), so this was the last Elementary school 運動会 (Sports Day event) for my kids. 運動会 (Sports Day events) are usually held from kindergarten to high school in Japan in September or October…but my oldest two daughters had their 中学校 (Junior High School) 運動会 (Sports Day event) last June (it was the first of my kids’ 運動会 (Sports Day events) that I didn’t attend because it was held on a weekday due to rain on the original day it was scheduled. (Click here to read my post about it)). 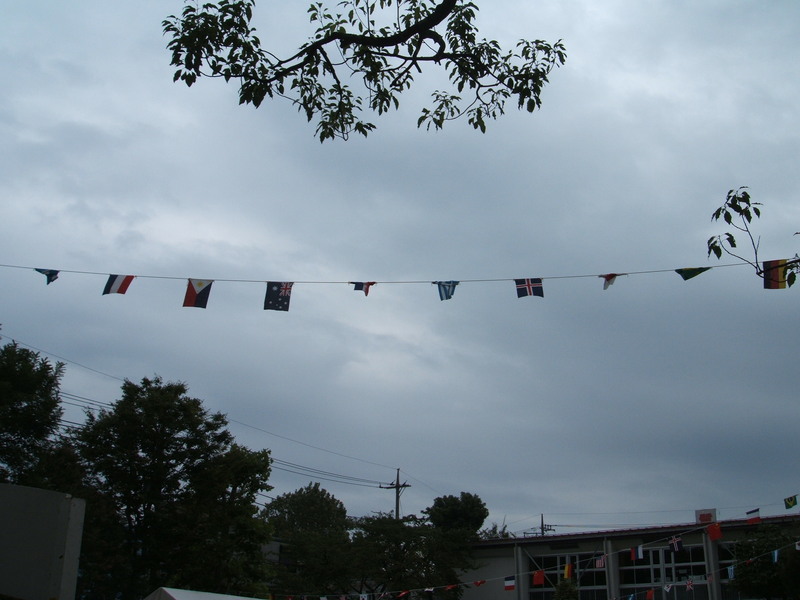 運動会 (Sports Day events) at Japanese 保育園 (Nursery Schools), 幼稚園 (Pre-schools) and 小学校 (Elementary schools) usually are decorated with strings of world flags hung over the school yard (中学校 (Jr High) and 高等学校 (High School) usually don’t decorate this way for their events). My daughter played the trombone in the marching band for the commencement of the 運動会 (Sports Day event), and she ran in a couple races and other events during the day. As they usually do, the 運動会 (Sports Day event) started at 9:00AM and went until noon and we stopped for lunch (my wife and daughters had prepared an excellent lunch for us) and after lunch, the games re-started and the 運動会 (Sports Day event) finished at about 3:30PM. I participated in the PTA 綱引き (Tug-Of-War). A long day. But, as always, alot of fun! This was the last 運動会 (Sports Day event) at the 小学校 (Elementary School)…next year, my youngest two daughters will be in 中学校 (Junior High School) and the oldest will begin 高等学校 (High School)! Today was my daughters’ 学校公開 (Open School) at their Junior High School. Today is Saturday, and there’s usually no school on Saturdays…but the school’s open on Saturdays when parents are expected to come (運動会 (Sports Day), concerts, Open School, etc), and then the school is closed the following regular school day (usually the following Monday). But this Monday is a holiday (敬老の日 (“Respect For The Aged Day” (click here to read my FAQ about it))…so my daughters’ school will be closed on Tuesday, so they can have a three-day weekend like everyone else in Japan (Sunday-Tuesday instead of Saturday-Monday). I watched my daughters’ English and Art classes. They did very well. 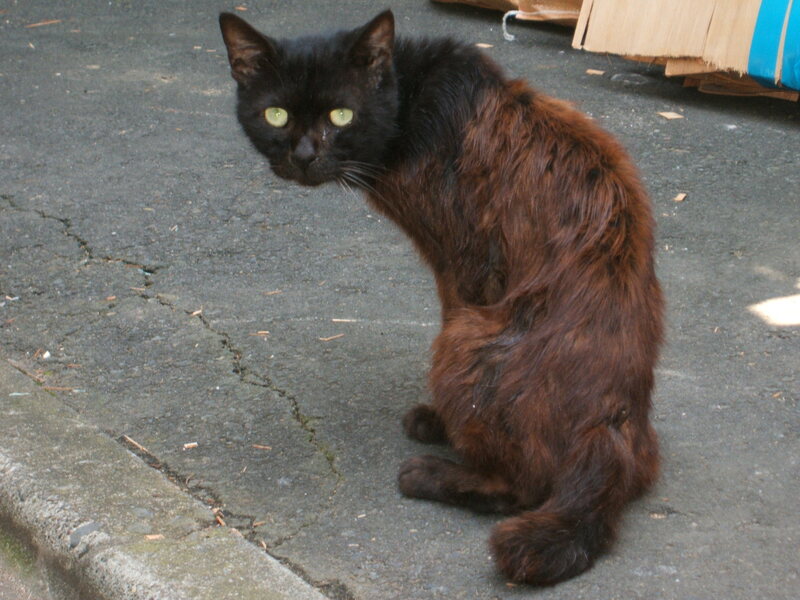 One the way home, my wife and I saw a stray cat with an unusual coat…all brown except for the black fur on his head. 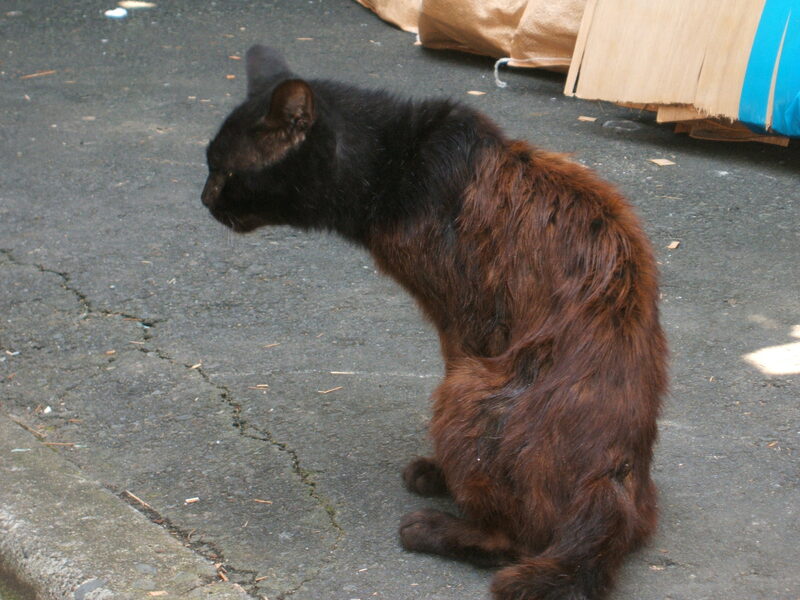 He was a bit mangy…but we still liked him. Anyways, there are a number of 秋祭 (Autumn Festivals) around Tokyo this weekend, but I probably won’t be going to any of them…we’re pretty busy this weekend. Anyhow, I’ve seen them all at least once each before.